How are the rivalling stars of Real Madrid performing at Euro 2016? On Saturday, the Round of 16 of Euro 2016 in France will start, with — amongst others — the match between Wales and Northern Ireland and the clash Croatia versus Portugal. A new opportunity for Real Madrid superstars Gareth Bale (Wales) and Cristiano Ronaldo (Portugal) to take their nations to the quarter-finals of the European Championships. The Welshman took the headlines by scoring three goals in the first round, which brought him the pole position on the goals scorers list. CR7 and his Portuguese club mate seemed to struggle during their group matches. It was a close call — Portugal finished third in Group F — but Fernando Santos’ squad made it through to the next round. However, it was only in the last match against Hungary, that Ronaldo scored for his country (Even twice). And that he did with a stroke of genius, as his backheel shot probably will be the finest goal of this tournament. When we look at the data, it’s quite obvious to see that Ronaldo, despite of his failure to score in the first two matches, was working very hard to help his team. He won 42,50% of his duels, almost 88% of his passes were accurate and gave an assist to a goal. Besides from these work ethics, he also unleashed 31 shots. But his shooting accuracy wasn’t that well as his passing: Just 7 of his shots were aimed at the goal. Welshman Bale, who, just like Ronaldo is for Portugal, is the one and only star of his team, the ray of hope for his nation. 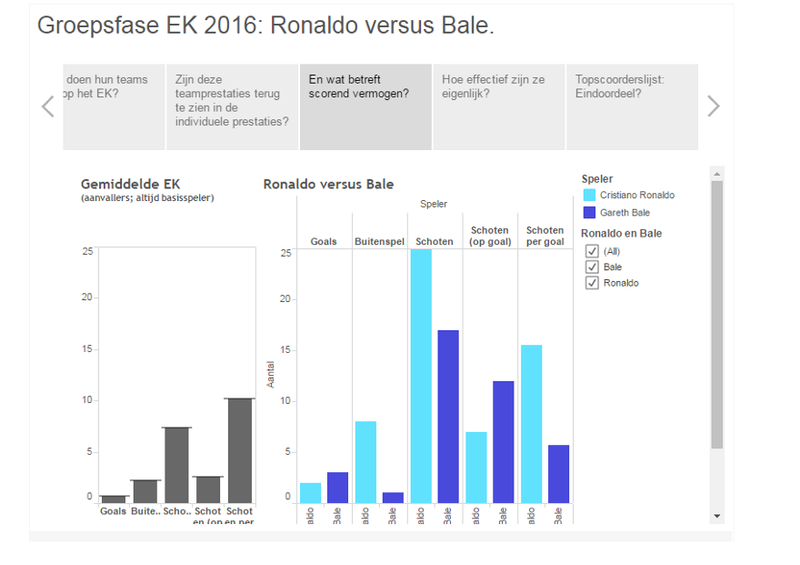 But, in comparison to colleague Galactico Ronaldo, the data show that Bale is far less active, when for example shooting is concerned. Bale produced 17 shots in total; almost 50% less than Ronaldo. But, from these 17 shots a formidable 12 were aimed at goal and three of them really hit home. Bale only needed a little more than an average of 5 shots to produce a goal, where his Portuguese counterpart shoots an average of 15 times, before he strikes. Although Bale is still more effective than Ronaldo, the Portuguese has the quality to score more goals in one match. According to Wikipedia, the goal scoring average of Cristiano Ronaldo at Real Madrid is 1,1 goal/match. For Bale that number is lower: 0,6. Dependent on how long both teams will be in the tournament and with regard of possible injuries or suspensions, the battle of who will be the best Galactico in Euro 2016, will remain to be close.